One of the first things you need to decide when starting a new website is the domain name you will be using. If you already have a brand in mind, the process is much simpler to do, you just need to find a yourbrandname.com or a variation of it for the site. 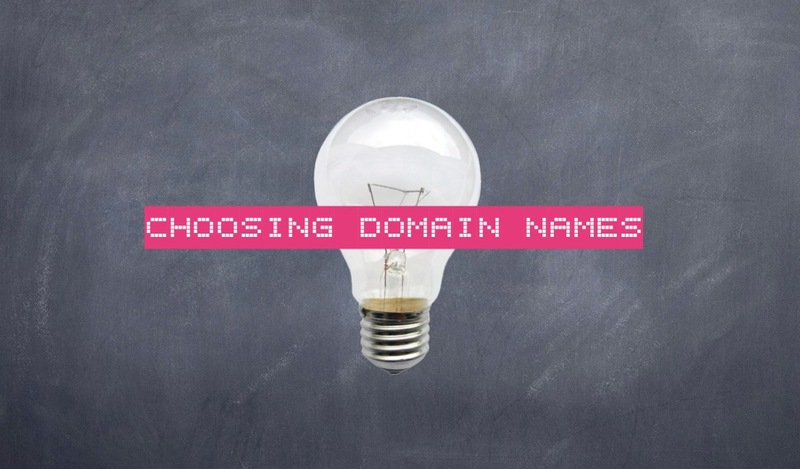 Choosing a domain name from scratch, however, is a bit more difficult. Regardless of the situation you are in, these domain name tips will help you find a suitable, effective domain name that works. Yes, keep it short! The shorter your domain name is, the easier it will be for customers – and potential customers – to remember it. You will also have the advantage of being able to share your domain easily. When a domain name is too long or too complicated, you risk your viewers typing it wrong and not being able to reach you at all. What if the short domain name for your brand is no longer available? You can either go for another TLD that works with the brand, find alternative domains that work just as well or simply go for a local domain name. Speaking of local or country-specific TLDs…. Local SEO is quickly becoming the hottest trend these days. If your business targets a specific market segment within a region, or if you are creating a blog or a website that focuses on local viewers, getting a country-specific TLD can give you the SEO advantage from the start. Google and other search engines are now taking location into considerations when ranking websites. Using a country-specific TLD, hosting your site on a server located within the same country or region and adding local SEO elements to your pages can help you rank higher on local search results. A domain name must be clear and easy to pronounce. You can share and promote your site on social media – and users can click on the link right away – but a domain name’s value extends beyond that. You will use it as part of your email address, you may need to tell people about it verbally. Making the domain name clear is very important. Avoid using a dash or numbers whenever possible. Unless they are part of your brand name, dash and numbers are not practical. The same rule applies to alternative spelling of a word. For example, “exposure” is better than “xposure” even though the two words sound the same. Avoid the letters "q," "z," "x," "c," “v,” and "p". This is not an absolute rule, but it will save you a lot of time and make the domain more memorable. it is very easy to be drawn into the latest trends when selecting a domain name. Using words like “top,” “best,” or “hot” may seem like a good idea when you are choosing a domain name, but it can quickly go out of fashion in a few years. A lot of site owners also make the mistake of adding the year when the domain name is purchased to the actual name. “….2015.com” is definitely not a good domain name to have now that it’s 2016. Also, don’t rely on uniquely spelled words that are trendy at the moment. You will face the same problems once the unique spelling is out of style. For example, using “z” to replace “s” (i.e. domainnamez.com) can make a domain name look outdated sooner. Even when you choose to use other TLD as your primary domain, it is always best to find a name that is also available as .com. You can then set a permanent, 301 redirect for the .com of your domain name in order not to lose traffic. Owing the .com version of your domain name will also help protect your brand in the long run. You don’t have to worry about someone else – or even a competitor – snatching yourbrand.com for malicious purposes. Some companies even take it a step further and secure all important TLDs for their brand. This is a costly move to make, but one that is worth making if you want to truly protect the value of your domain name. A domain name is only as good as the content that can be found through them. Once you have a good domain name to use, you can develop its values and have it as recognizable as it can be. What separates great domain names with good ones is how easy it is to develop those values. Domains like Amazon.com don’t really represent the type of content they represent, but you recognize the successful ones just as easily. On the other hand, domains like Hotmail.com and WebMD.com are easily recognizable, making them easier to develop in terms of value and recognition. See the difference? If you find this post useful then please like and share it with your friends on social media. Do let us know your views in the comments. Hi there! I am Santhosh Kumar and I am a true enthusiast in the areas of Technology and Programming. I am a Software Engineer and part time blogger. In my personal life I spend time on Travelling to new places and Gaming. All the content on this site is copyrighted to GeekChips. No one can reproduce it on some other sites without our permission. Please refer our policies to find more details. Geek Chips © 2016. All Rights Reserved.